Feeling a little lost when coaching, playing, or watching a soccer game? Don’t understand what coaches, players, and fans are yelling out? Hopefully this list of soccer terms will help you! Hitting the ball with the heel of your foot to kick it backwards. Refers to players who only watch the ball and don’t know where nearby opponents are. A kick where the ball curves like a banana. This type of kick is seen with corner kicks and free kicks. A kick where the player leaps into the air and while falling backwards, kicks the ball over his/her head. If done near an opponent, it can be considered a dangerous play and a foul will be called. When an attacking player is in possession of the ball gets behind the defense and the only player left to beat is the goalkeeper. When a player tries to take possession of the ball from an opposing player. To kick the ball out of the danger zone, meaning out of the scoring range for the opposing team. To restrict an opponent’s movement by forcing them to go in a certain direction. This will give your teammates time to get back and help. Containing also means not to lunge in or poke at the ball, which usually results in the opposing player getting past you. When a player pretends to receive a ball but then intentionally lets the ball go past him/her or through his/her legs to another teammate. A loose ball where both teams have an equal chance of getting. A player passes a ball to a teammate and then makes a run to receive a return pass. To kick the ball while it is in the air but after it has bounced on the ground. To hit the ball with your head. Refers to a team that kicks the ball forward and then runs after it. There is minimal passing and ball control. A player from the opposing team is closing in on you with the intention of taking the ball. To stay close to and follow an opponent in order to stop a ball from being passed to them. When a player intentionally passes the ball through an opponent’s legs and receives it on the other side. When a player moves out of his/her own position and runs past a teammate. Refers to defenders moving forward towards the midfield, usually to try and catch the opposing team offsides. To receive a pass and keep the ball in control. To take possession of the ball from the opposing team. This can be while standing or by sliding. A pass into space behind the defenders in the hopes that an attacking player will beat the defenders to the ball. To kick the ball while it is still in the air. WINNER: Panini World Cup Sticker Album! 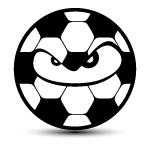 Copyright © 2019 Sideline Soccer, All Rights Reserved.